Beautiful Sun Montessori: Passing the torch. Today was our last day of school and our "moving on" ceremony. The plan for it evolved over some weeks of going back and forth on ideas and it ended up being simple, significant, and beautiful. I am so pleased with how it went, and was able to enjoy ever minute of it. Our ceremony began with the oldest children sitting on one side of the line, and the second years sitting on the other side. Parents and first years sat in the space remaining, and anywhere else they could fit on our school porch. (I've been reading about tea ceremonies, and liked the idea of humility- the honored children sitting in chairs, and everyone else on the floor). I explained how the line is an exercise for mastering gross motor control, and that the oldest children would demonstrate their mastery by walking around it with a lit candle (Aruban trade winds permitting). One at a time, each child walked on the line with a candle and then presented the candle to a second year child. This represented a passing of the torch. The second years, in turn, had made "garden necklaces" (a material in our class for choosing to be out in the garden) and gave one to each of the oldest children. This represented how the old children will now be "outside". 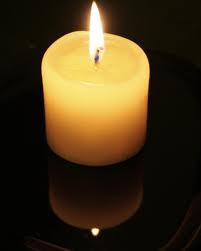 It was lovely to see the children walking solemnly with their little candle flames flickering. The sharing of the candle and necklace gifts was very sweet. After reading them a short letter with advice for the future (1)be kind 2)take care of plants and animals...) , we all went to our lunch room to watch the graduation video (see posts below). All this ended with a picnic in our yard. It was a perfect morning. Complete. I think this will be our standard ceremony for future years. That sounds so lovely! Thank you for sharing this!